By now we all know the broad strokes of the Tomb Raider mythos: a rich heiress spends her vast wealth self-funding expeditions to unlock the mysteries of the ancients. It’s Batman meets Indiana Jones. Crystal Dynamics’ 2013 reboot afforded the developer to recast the character and show her origins. From the very beginning, the studio was clear that it wanted to show how this young and impetuous woman became the legendary figure we all know. It was such a hit that it prompted two sequels: Rise of the Tomb Raider, and now, Shadow of the Tomb Raider. But if you’ve missed those first two, or your memory is just a little rusty, we’ve compiled a short primer to catch you up to speed before you start to play Shadow of the Tomb Raider. The first of the rebooted series worked mostly to establish the personality and naivete of this newer iteration on the character. Setting out upon her first expedition to find the lost kingdom of Yamatai, she ignores the advice of more experienced voyagers and suffers catastrophic consequences. The ship sinks and the crew, including her friends, are left stranded and in various degrees of danger from the island’s inhabitants. The peril of the situation she finds herself in forces her to fight her way out, including killing some of her captors. However, Lara also discovers that the island is indeed Yamatai, and some mysterious force has kept it lost to the legend. After witnessing a rescue plane fall victim to a sudden storm, it becomes clear that her ship’s misfortune wasn’t a coincidence. Lara learns that one of the men claiming to be a crewman on her ship is actually the leader of a violent cult—intent on using her friend, Sam, as a sacrifice for a religious ritual that will transfer the island queen’s soul into a new host body. Lara fights her way through the cultists and destroys the queen’s remains, freeing her friend. The remaining survivors—Lara, Sam, and Jonah—are ultimately rescued by a cargo ship. But Lara states that other mysteries are out there waiting to be discovered, and she intends to find them. 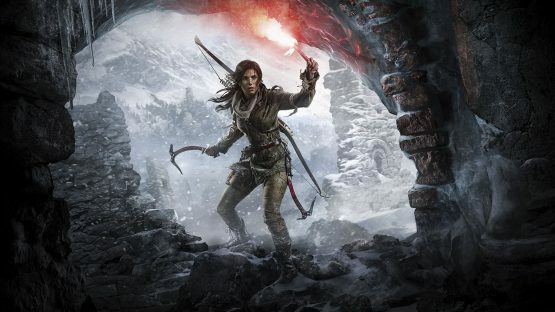 After establishing the personality of the new Lara Croft, the sequel set about giving her a nemesis. Rise of the Tomb Raider has its own standalone adventuring story, but its main contribution to the overall meta-plot is the establishment of Trinity—an ancient order of knights turned into a well-funded group of paramilitary treasure-hunters. The story opens with Croft suffering from post-traumatic stress disorder after the events of the first game. She turns to her own father’s research on the lost city of Kitezh, once again ignoring advice from her father’s old business partner, Ana. It was the research into Kitezh, Ana claims, that drove Lara’s father to suicide. As Lara investigates in Constantinople, she’s set upon by Trinity forces led by a man named Konstantin. She realizes a marking in the Constantinople tomb connects to a book from her father’s study, but then finds it has been stolen. She takes her friend Jonah with her on a trip to Siberia to recover the book from a Trinity base. There she’s captured, and Ana is revealed to be a spy for Trinity, seeking the Divine Source to help her survive a terminal illness. As Lara escapes from the prison, she rescues a stranger named Jacob. Jacob is revealed to be the leader of the Remnant, descendants of the prophets who protect the Divine Source of immortality. Trinity leads attacks against the Remnant, leading Lara and Jacob to decide they need to find the divine source before Trinity can. After Jonah is fatally wounded, Jacob heals him and reveals that he is the new Prophet and has been granted immortality himself. While seeking the source, Lara finds Konstantin, who says that her father was actually assassinated by Trinity. Ana discovers the Divine Source, but Lara destroys it, and Jacob thanks her for granting him death as he fades away. Lara and Jonah join together to plan their next expedition, this time with a new resolve to stop Trinity’s plans to exploit ancient artifacts. But before leaving Siberia, Lara meets with Ana, who denies assassinating her father despite Trinity’s orders to do so. Ana is then killed by a Trinity sniper, who is ordered by a superior officer not to kill Lara as well. Crystal Dynamics has established some important information going into this third game in the rebooted trilogy. Lara is an experienced adventurer, but has a tendency to disregard warnings and rush into danger. Trinity plans to use the power of ancient relics to establish its own world order, and Lara feels more than justified taking or destroying the artifacts herself to prevent them from doing so. Someone in leadership at Trinity felt it was important to keep Lara alive, even after she had interrupted their plans. And alongside her is Jonah, her best friend and companion who has been with her from the very first expedition. All this comes into play as she and Jonah explore Latin America seeking a Mayan relic, with Trinity close behind. Trailers and other marketing materials have established that in the process she inadvertently sets off an apocalypse, but you’ll have to play to find out just why and how—and what she does about it once the otherworldly events are set in motion.